The Trogulidae are a Western Palearctic family of soil-dwelling harvestmen with advanced soil crypsis and a very uniform appearance. Body shape is elongated and dorso-ventrally compressed. In Anelasmocephalus and Konfiniotis it is more drop-shaped. All species exhibit a more or less prominent head cap consisting of bifurcated branches that shield the chelicerae dorsally. The body and the legs are covered with rounded papillae, partly set with bristles, and particles are glued between these by body secretion, giving the animals the appearance of a piece of soil. Movement is slow, and they are hard to find as they rarely move when disturbed. Most species seem to prey on snails, and Trogulus has been observed to deposit its eggs in empty snail shells (Pabst 1953). Based on molecular phylogenetic analysis there is weak support for a grouping of the drop-shaped Anelasmocephalus and Konfiniotis but strong support for grouping the remaining flat-bodied taxa. The genus Anarthrotarsus was not available for this analysis but most likely belongs to the latter group as well, based on the similar body form. The number of taxa within Trogulidae is highly underestimated due to the homogeneous external morphology. Revisions are tedious, and necessitate incorporation of multiple traits from molecular data and morphology, requiring extensive material available for delineation of morphological units (Schönhofer & Martens 2010). Pabst, W. 1953. Zur Biologie der mitteleuropäischen Troguliden. Zoologische Jahrbücher. Abteilung für Systematik, Geographie und Biologie der Tiere 82:1-46. Schönhofer, A. L. and J. Martens 2010. 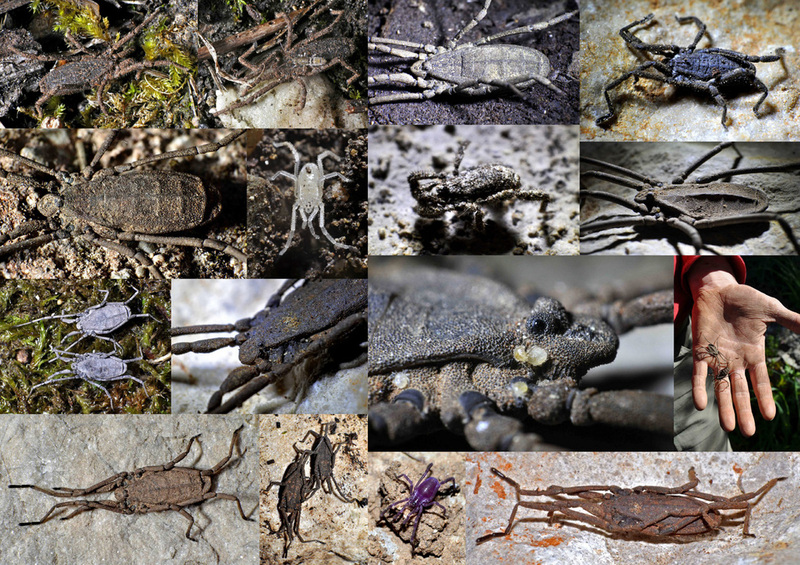 Hidden Mediterranean diversity: Assessing species taxa by molecular phylogeny within the opilionid family Trogulidae (Arachnida, Opiliones). Molecular Phylogenetics and Evolution 54 (1):59-75.